To all of you who've purchased an Xpo Press show guide. Thank you! I hope that you enjoy the convenience of having it mailed directly to your home or office BEFORE the general public sees it at a gem show! Your purchase truly helps support Xpo Press’s efforts to celebrate and raise awareness for one of the most interesting and spectacular events on the planet — The Gem and Mineral Show! Many expos, conventions and tent shows around the country are becoming a thing of the past, mostly due to the rise and ease of doing business on the internet. But not The Gem & Mineral Show. These wondrous and educational events are not only surviving but thriving and gaining momentum everywhere. Why? Because we need to see and touch, experience and connect with the magnificence and wonder of gems, minerals, fossils, beads and jewelry before we take them home and make them a part of us. And the best way to do that is at a gem show. So ... Long Live the Show! And the Show Guide! Yay! You can purchase eleven different guides from Xpo Press from the Buy EZ-Guides page, and we’ll mail each one to you well before the show begins. 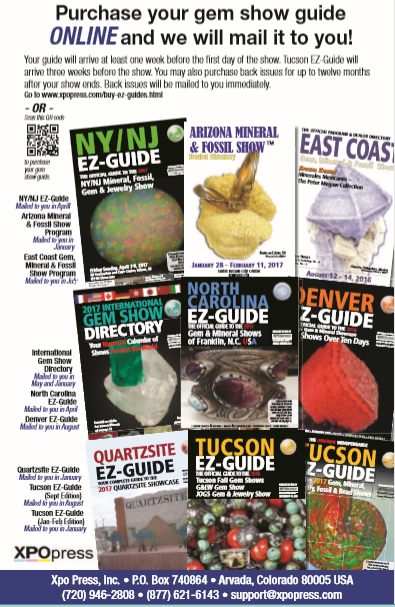 Each guide is packed with show information, vendor locations at the show, colorful ads from vendors and shows, and articles relevant to the gem show or other show-related events. Here's a Special Offer for new and renewing subscribers. Go to the Buy EZ-Guides page and find out the cost of any of the guides you'd like to purchase. We'll take $2.00 off the cost of any guide (more than one if you'd like) — but you'll have to mail a check or call or email us with card payment info because our online payment system doesn't permit discounts. If you're going to mail payment, be sure to let us know what guides you're purchasing and don't forget to include your mailing address and email address. Make checks out to Xpo Press, and mail to Xpo Press, P.O. Box 740864, Arvada, CO 80006.